Joyce stood in the “Basic Tools” aisle of the hardware store, trying to do mental math. How much money did she have yesterday in her bank account when she logged on? How much were the pancakes and black coffee she had this morning? How much money did she tip the nice waitress with the red hair who kept trying to force fresh squeezed orange juice on her? All of her equations kept coming up to less than zero, which meant she would have to steal the hammer and nails she needed to fix the boat, which was unfortunate. She really hated stealing, even if she was good at it, and even if it gave her a rush when she shoplifted, walking out of a store with a clandestine item (chocolate bar melting in her pocket, two pairs of Victoria’s Secret underwear tried on but never taken off, CD in the lining of her purse). She wandered further back into the store and saw a little boy alone in the aisle of nuts and bolts, putting his hand into the buckets and closing his eyes. When he opened them and saw her, he stiffened and his hand shot out. “I’m not here to bust you,” she said. “You’re not my Mom,” he said, and he walked down the aisle, away from Joyce, looking over his shoulder like she might follow him for some reason. Joyce put her hand into the same bucket the boy had his hands in, enjoying the feeling of the bolts getting out of the way of her hand. It was cool, calming. Her hand felt its way towards a bit of surprising rubber, which she pulled out. It was a bouncy ball. She bounced it once then put it back where the boy had hid it. “You’re not my conscience,” Joyce said, but she left with the three stolen letters and the stolen hammer and the paid for nails, and she got none of the rush that she usually did. She wandered away from the hardware store and up the two-lane road, which was marked only by white paint. There weren’t many cars on the road up here, she walked for hours and didn’t see any a single one. She tried mental math again. How much money had she stolen and then where had it all gone? She didn’t remember all the things she’d ever stolen, and she could never figure out why the money kept leaving as fast as she could steal it. When she stole, she’d usually want to steal more. Like feeding a beast that just got hungrier no matter how much you feed it. It was a slumbering creature, which was good – sometimes it would fall asleep for days, weeks, months at a time. Joyce liked when she didn’t want to steal things, when she felt like she had gotten something out of life worth paying for. Like the company of that redheaded waitress, and the fluffy pancakes, and the coffee that just tasted rich and exciting. The caffeine still pumped through her as she crested a small hill and saw the mist and the valley lay out in front of her, all the way to the lake where her boat was hidden. Well, it was actually a nice young man’s boat who didn’t know that the evening he spent with her was also all the payment he was ever going to get for the boat and the boat trailer. Joyce wanted to steal just one more thing before she got to the boat. She could smell campfires to the left and right of her, which meant some intrepid folks had gotten up and maybe stuck cinnamon rolls on the end of marshmallow roasters. Or maybe they were just melting the soles of their rubber shoes onto the edge of fire pits. Regardless, a breakfast before she started fixing the boat seemed in order, so she followed her nose to a couple’s campsite, tromping through soft pine needles, tripping over roots, making a path all her own. The couple was attractive – their hair was mussed, they had coffee percolating on the edge of their fire pit, the boy was trying to get the propane attached to an ancient Coleman camp stove, the girl was giggling into her sweatshirt sleeve. “Hi there,” Joyce said. I’ll just steal a bit of their kindness to strangers, she thought. “Hey fellow traveler,” the boy said without turning around. Joyce went over, softly shoved him aside and expertly attached the propane to the stove and got the burners going. They were both suitably impressed, and the boy took a camp toaster out of a plastic container and put some slices of bread onto it. Joyce sat down on a log and took their kindness and offered no grace in return. “What are you building?” the boy asked, gesturing at her bag. Posted on Wednesday August 25th, 2010 Wednesday March 26th, 2014 by Max Elman. 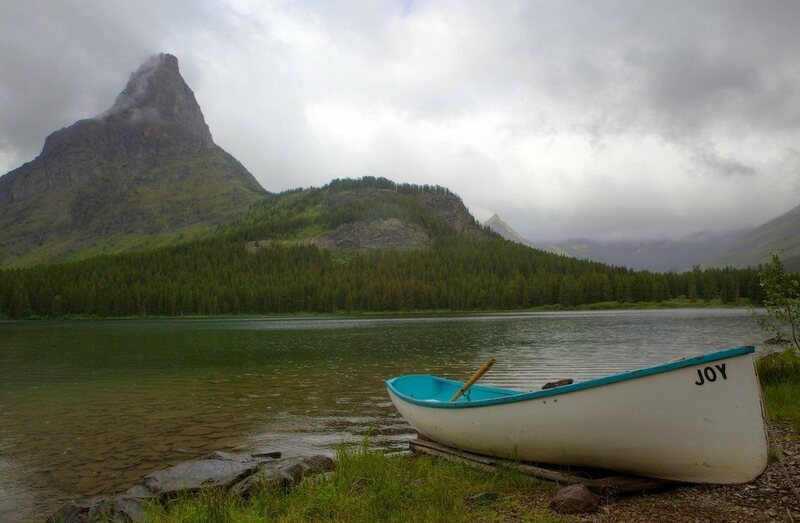 This entry was posted in Photos & Stories and tagged boat, montana, theft, water. Bookmark the permalink. Feeling a little like you could use some luck (or cash)? Keep writing. I like it.